Hype, buzz and excitement. Every film has its fair share. But what about those films that don’t come with any of these? Those that just appear without any buzz, hype and excitement and blow you away or those that exceed expectations and succeed in a whole new dimension. In this Top 5 Surprises of 2011 countdown Bollyspice honours films that came silently and conquered the hearts of audiences. Amol Gupte depicted rather brilliantly with Stanley Ka Dabba the power of a small budget entertainer. Prior to release not many even knew of the title but come release day the Stanley Craze spread like wild fire! The Taare Zameen Par writers who struggled to finance and distribute his film soon found that multiplexes were being forced to increase the number of shows of his film in order to meet the rising demands of audiences. Without a doubt a gem of a surprise that just crawled into our release calendars and forced audiences to fall in love with it. Their definitely was curiosity surrounding AB Corp’s Bbuddah Hoga Tera Baap, however was this buzz and excitement positive was not quite known. Many were sceptical of how this film would turn out and if it would just be another masala gore fest by Puri Jaganath in which Amitabh Bachchan will attempt to revive his career and Raveena Tandon would perform a sizzling comeback item number. Surprisingly the film turned out to be one hell of a family entertainer with a beautiful soulful storyline. Every character warranted attention be it Big B, Hema Malini, Raveena, Sonu, the vicious Prakash Raj or newbie Charme and fairly unseen Sonal Chauhan. Families fell in love with Vijju and his eccentric ways and before they knew it AB Corp had a hit film on their hands. A modest budget ensured the film was a blockbuster rather effortlessly without accounting for the precious satellite rights. BHTB turned out to have much more to it than ‘Chandigardh Di Star’ and was far more than just a comeback vehicle for Big B. From time immemorial Indian cinema has had actors who are fabulous actors without a doubt but who are also mostly recognised for their work in supporting roles. Seldom have such actors delivered successes when they carry a film on their own shoulders. Madhavan and Kangana Ranaut are two such actors of current times whose most notable work has been in films in which they have not been leading actors. 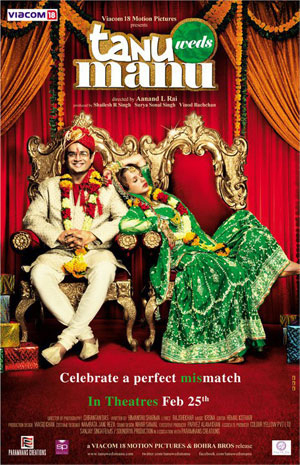 However, in February 2011 we had a revelation onscreen in the form of Tanu Weds Manu. Overnight they became the audience’s most beloved Tanu and Manu. The film took off to such a great extent that a German dubbed version was released and there are talks of a sequel. Tanu and Manu were definitely one of the silent conquerors of 2011. It may surprise many to find ZNMD on this list however there’s a very valid reason for its presence. Post Luck By Chance the expectations from a Zoya Akhtar film were that it would most definitely be accepted by critics and prove to be a success amongst the multiplex crowd but box office success was doubtful. Much to everyone’s surprise ZNMD went down as one the most iconic films of 2011 which is surely to gain the tag of a cult film in years to come. The producers and industry enthusiasts were all left shocked when the numbers for ZNMD started rolling in from all over. Today it has gone on to become the 9th biggest ever blockbuster worldwide surpassing the collections of Dhoom 2. It is the unprecedented box office success of ZNMD that lands it safely on #2 of our Top Surprises list. 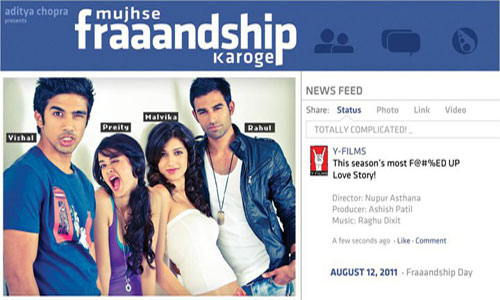 Mujhse Fraaandship Karoge’s promos and posters didn’t boast of much, however come release day, the audiences are left stunned. Not many watched the film as a planned event but once they had they were sure to spread the word about its impressiveness. MFK was youthful, face paced, fun, entertaining and had a soulful story to accompany it all. Sadly the lack of buzz and lack of expectations from the film meant that at the box office it didn’t fair well as it just past the 5 cr mark, however critics and audiences alike have gone far and wide to gush about the film. If poor box office collections didn’t stop an iconic film like Andaz Apna Apna from becoming the cult film it is today then there’s little doubt that MFK will go down in history, even if its success is credited to DVD sales. Take a bow 2011’s biggest surprise! Whilst the list is limited to only five names we cannot wrap this countdown up without special mentions to other worthy titles. Firstly there’s Nikhil Advani’s Patiala House which became the surprise entertainer of the year and reminded audiences of the director’s capabilities and also that Akshay Kumar can do more than just comedy. Another credible film to miss out on the list was Murder 2 which was marketed to be quite the sleeze-fest but ended up being one hell of a fine crime thriller, even if it was with a borrowed script. We also cannot forget Shor in the City which surprised us all with a decent box office collection along with receiving much appreciation in the festival rounds it did. Pyaar Ka Punchana misses out on the list every so slightly but definitely cannot be overlooked as it managed to be such box office success without any star power to back it. And with those notable special mentions, it’s time to wrap our surprises countdown and look ahead to the titles that could just be the under dogs of 2012!